For other uses, see Zambo (disambiguation). A representation of an infant zambo, in an 18th-century "Pintura de Castas" from New Spain. The painting illustrates "from a Black and an Amerindian produces a lobo", here a synonym for zambo. The term zambo was not formally used in Spanish writing until the seventeenth century, and often competed with other terms, including mulato. African slaves began mixing with indigenous people from the beginning of their importation into Hispaniola in the early sixteenth century. Some of this mixture took place in the mines and plantations of Hispaniola, the other Spanish Caribbean islands following the introduction of sugar production in the 1520s, and also when Africans fled from these estates to unconquered indigenous regions. Unions described as producing zambos took place all throughout the Spanish colonial empire, following the pattern established in Hispaniola; and the group was generally classified among those people who were not of European ancestry. In the eighteenth century, the Spanish began producing systematic racial classifications, and zambo was defined in its final meaning. Some famous zambo groups were created by runaway or rebel Africans who mixed with or took over indigenous communities. In the unconquered regions of Esmeraldes, in what would become Ecuador, for example, a small group of shipwrecked former slaves managed to win control of the indigenous communities, eventually representing them before Spanish authorities in the late sixteenth and early seventeenth centuries. Another famous group of zambos were the Misquito Zambos, who originated around 1640 when a group of African slaves revolted on a slave ship, took it over and wrecked it at Cape Gracias a Dios on the border between Honduras and Nicaragua. They united with the indigenous Miskito people, and by the early eighteenth century came to dominate the kingdom, leading it on many extensive slave raids. Their alliance and protection of English speaking merchants and settlers in the area helped Great Britain find the colony of British Honduras (present day Belize). "From a black man with a mulata produces a Sambo", Indian school, 1770. Officially, zambos represent small minorities in the northwestern South American countries Colombia, Venezuela, Guyana, and Ecuador. 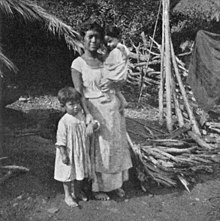 A small but noticeable number of zambos resulting from recent unions of Amerindian men to Afro-Ecuadorian women are not uncommon in major coastal cities of Ecuador. Prior to the rural to urban migration, the Amerindian and Afro-Ecuadorian ethnicities were mostly constrained to the Andes region and province of Esmeraldas and the Chota Valley in the province of Imbabura respectively. In Central America, there are two indigenous-African mixed groups, the Miskito and the garifunas. The Garifuna originated from the combination of Africans who were either shipwrecked or fled from neighboring islands to St. Vincent, in the course of the seventeenth and eighteenth centuries. In 1797 they were deported by the English for their role in supporting France during the French Revolutionary Wars to the island of Roatan off the coast of Honduras. From there they spread up and down the coast of Central America, communities being found from Nicaragua to Belize. In Mexico, where zambos were sometimes known as lobos (literally meaning wolves), they form a sizeable minority. According to the 2015 Intercensus Estimate, 896,829 people identified as both Afro-Mexican and Indigenous Mexican. The great majority of the country's Afro-descended population has been absorbed into the wider mestizo population. Greater concentrations can only be found in communities scattered around the southern coastal states, including Michoacán, Guerrero, Oaxaca, Campeche, Quintana Roo, Yucatán, and Veracruz, where the country's Afro-Mexicans reside. Culturally, Mexican lobos followed more Amerindian traditions rather than African influences. This acculturation also took place in Bolivia, where the Afro-Bolivian community absorbed and retained many aspects of Amerindian cultural influences, such as dress and use of the Aymara language. These communities of Afro-Bolivians reside in the Yungas region of the Bolivian department of La Paz. ^ "Peoples Listing: Zambo". Joshua Project. U.S. Center for World Mission. Retrieved 2008-08-27. Stranded in Paradise: Shipwrecked Hundreds of Years Ago, the Garifuna Are Still Trying to Find Their Way by Teresa Wiltz, The Washington Post.